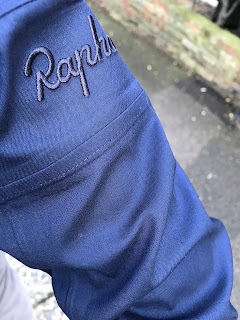 I've been testing Rapha's most luxurious jacket to comment on its functionality aside from more subjective issues of desirability and value, which I'll come to. Actual as well as perceived quality is very high, as befits the price. I expect eye brows might be raised at the 'specialist dry clean' requirement for a jacket made of a fabric comprising 93% wool, 5% silk and 2% elastane, but it does not feel like a delicate jacket. 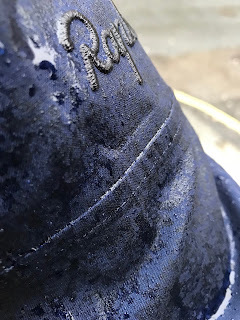 To the contrary, it feels if anything like a beefed-up version of Rapha's Classic Winter Jacket, which for all its careful detail does feel and look a bit too much like a generic 'Goretex-anorak' waterproof to sustain its £260 price. Instead, the 'hand' of this fabric is exceptionally smart and lovely. It's leagues away from anorak, and that, surely, is the point. I've also tried to capture the colour, which is difficult to perceive accurately from Rapha's website pictures. It's only available as this single shade of inky blue, that plays brighter in bright light and darker when wet, as I've tried to show here in photos. Personally I love it to bits. It's pure class. I've tested the jacket in torrential rain, and it's just as waterproof as the Classic Winter Jacket. 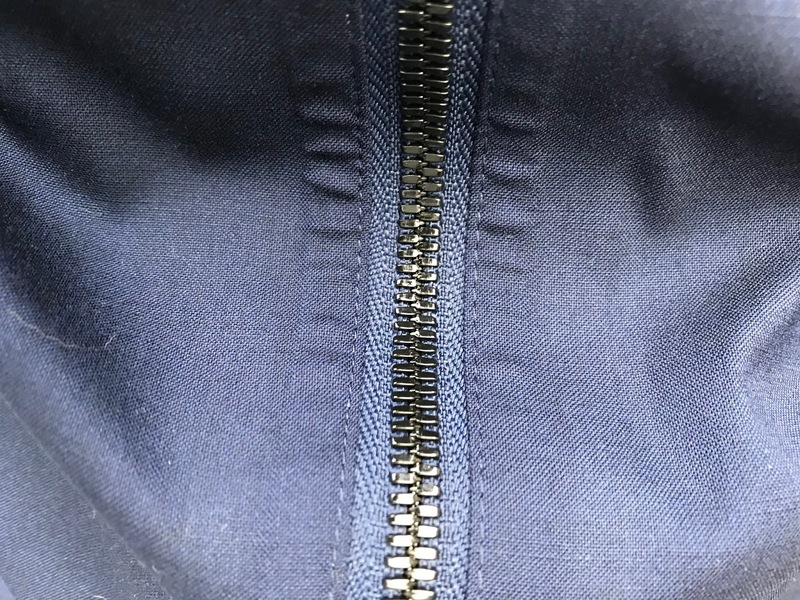 On the downside, it's a 'hotter' jacket than the old softshell if you're riding harder or to catch the train, and come the Spring and Summer it will be too hot in many situations. The flapped back pockets number two. Their entry-point is higher than the original softshell which makes them harder to access quickly, but having said that they are large enough to accommodate an iPhone 7+ on its side, the flaps keeping it out of sight and rain: brilliant. But I wish the pocket entry point was a bit lower and easier. 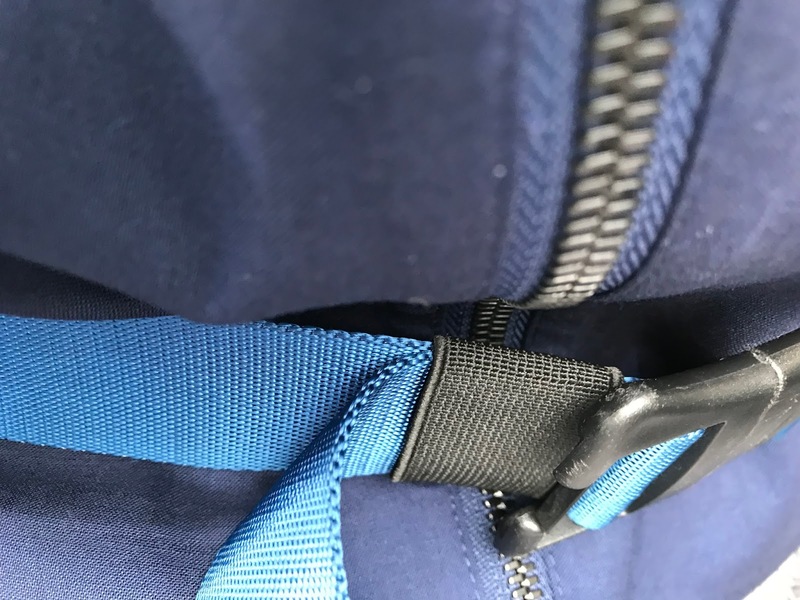 You really have to jack your arm around to gain access, and I'm saying that as a yoga-practising person....the ever-higher-pocket syndrome is a casualty of the low fronted style that has swept the board in recent iterations of Rapha jerseys and jackets. My other criticism here is that the new jacket isn't 'soft'. The one thing you could say about the original was that the faintly neoprene-ey fabric had a soft hand. Here, we have a luxuriously matte, and non-shiny fabric that oozes refinement, but it's not soft as such, a characteristic enforced by the seaming of the tapes on the inner surfaces. I should note upfront that I have always worn my (black) softshell primarily for commuting and utility riding. So it gets used far more than any other garment. 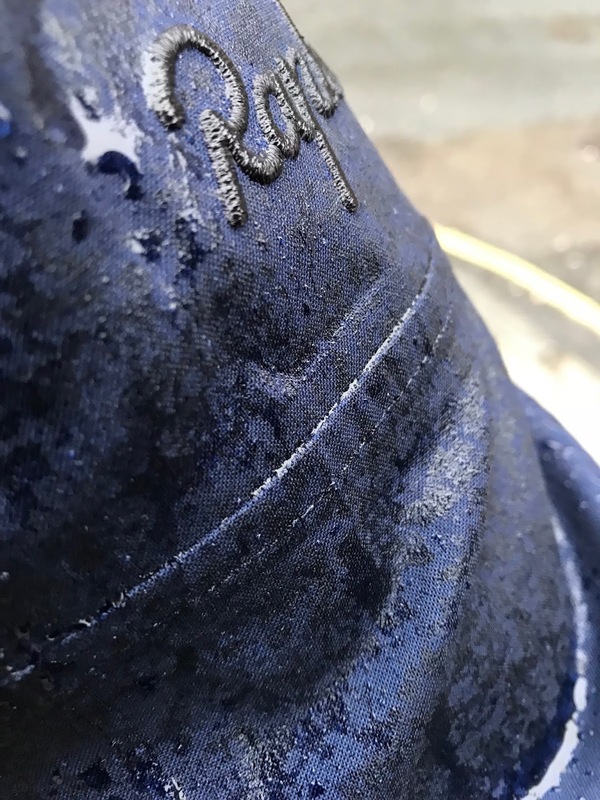 Every day in all weathers except serious rain, when I take an early generation Rapha City collection waterproof. It could always withstand a shower but no more - which suits 95% of British riding. I have always loved the softness of Rapha's original softshell, in the literal sense; I have always rated its very high breathability at the expense of being waterproof; and I have grown so used to having nice big back pockets (x3) for my iPhone and much besides, that I honestly don't know where I'd be without them. I still have a black softshell, my third since 2004, and I wear it over normal shirts for commuting in what would now seem to be an unacceptably 'loose' look (it's deliberately Large but normally I'd be Med or even Small); yet to the unsuspecting outside world it looks nicely tailored - what's the fuss? So I remain very fond of the old, original, softshell. It might have been a compromise between aero fit and sloppy fit, between road pockets and smart appearances, and between waterproofing and breathability, but sometimes such a hodgepodge is a brilliant fit for a changeable climate and multiple requirements: everything is a trade-off in the end. Turning to this new product, it appears to be doing several things at once. It's re-introducing the softshell but at a higher price point and via a very enticing tie-up with a legendary Italian brand. Very Rapha! But it's also bringing the product back to a smarter than ever city/commuter appearance. Discounted less than a month after introduction by 25% suggests that the tough retailing atmosphere and Rapha product onslaught may have made this garment a tough sell, but at the discounted price you're getting a simply amazing product for just £40 more than the ordinary Classic Winter Jacket, which is an outstanding product in its own right but utilitarian compared to this. 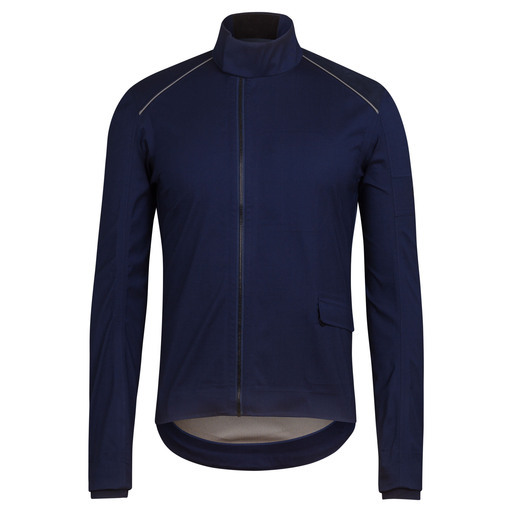 If I was looking at buying one, it would be a no-brainer to get the Loro Piana jacket - it's like getting a Rolls Royce for a fraction more than a VW Golf, and for sure you can do the chat laps at Regent's Park in this, and then go to work too. 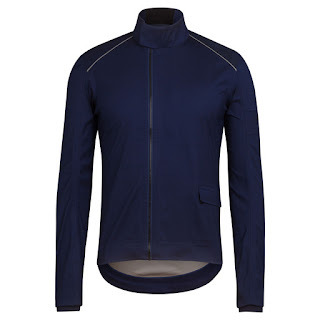 Granted, there's been a murmur of the usual Rapha hate on a forum I've seen, (* price/ blah/ stupid/ blah) but only until someone else pointed out that Loro Piana suits go for thousands and that the actual functionality of this jacket is far beyond men's fashion items costing far more. Just study that black zip. It's all gorgeous stuff. If you're still wearing bin bags that's fine. If cycling is your religion then like me you will welcome this jacket, especially at it's unexpectedly discounted price so soon after launch. 2-speed 'low' gearing; rack; titanium model; plumbed in dynamo lighting; upgraded tyres and Brooks saddle. Actual cost £1,750. I've now had the Brompton for 8 months. It's been a mixed adventure. My summary thought is that it plugs a gap, but the gap it plugs is one that shouldn't exist, and I bitterly regret that it does. Put this comment differently: I've never seen anyone with a Brompton in mainland Europe. Why? But first things first, what's it like? 1. 'Clever' at folding. Obs. 2. Feels solid if you remember to tighten those different knobs. Eurostar. Yes, it can do this. Aimed at vicars and non-cyclists and BBC executives. 2. The £320 lights are wonderful except that they're situated too low, below car mirror height. So that's a problem. 3. Un-folding and folding it is just a pain. All the time. 4. The very foldability makes it an easy target for thiefs on trains, so you'll need a cafe lock. 5. Heavy to carry into buildings and shops. 6. Embarrassing and stupid to carry it into offices and shops, and annoys everyone else. 7. It's existence has allowed train companies to shirk their responsibility to carry bicycles. 8. The rack is recommended because it protects the rear mudguard, but the reason Brompton plug their own jewel-sized 'box bag' is because putting a real bag on results in heel interference on every turn of the cranks because the luggage rack is obviously set too low. That's a problem. 9. 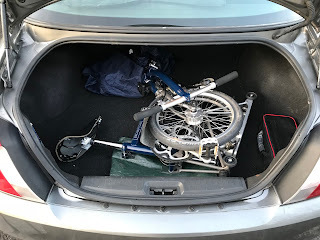 The whole Brompton Universe is it's own thing so you need a separate set of spanners, inner tubes, car valve pump, pump extender valve connector because the valves are too short an the spokes too close to get a good connection. This lot weighs 400g and jangles. If you get a puncture as you will with the Kojaks, you'll need a YouTube demo to get the wheel on and off. 10. The idea that it won't get nicked because it's never on the street is nonsense. Unsecured indoors may well be much more risky than locked correctly outside. Duh - it's portable and they all look the same and have a high residual value on Gumtree. In fact that means that I never feel it's safe when under the coats at Pizza Express. That's because it's totally unsecured and unsafe. Anyone can simply walk off with it. Ruins any meal. 12. The titanium frame (rear triangle only - the grey bit) option reduces weight by 500g at exorbitant cost. 13. Unlucky number: if you lock it up outdoors you'll lose that Brooks saddle in minutes. Yep, it happened to me within 30 minutes of locking it up in Oxford one fine day, when I could not really imagine carrying the damn thing inside to a formal meeting. Why don't they provide a security skewer as standard? 15...but it's frequently difficult to do that unless you have a large D-lock, and where do you put that? It might be a British design icon, a clever contraption and an improbable commercial success, but I can't shake the thought that everything for which the Brompton was designed is a concession to a British society that by and large hates cyclists. If you put one into the boot of a car, I want to know why you're not riding instead. When I took it on Eurostar it was only because Eurostar hates bikes, and even then I had to put it in a ridiculous bag. WHY? When I arrive at a destination the idea of having to take the bike INSIDE because we have a society so riddled with bike thieves that it can't be locked up OUTSIDE, is, if you think about it, simply incredible. I hate the noddy looks and will never come around to them. 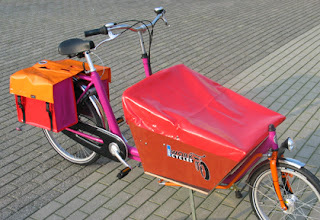 It's a clever device, but as a bicycle it's unquestionably a compromise. Despite Bromptons being raced and all that stuff, it's slow and you'll get overtaken. It's ideal operating range is 1-5 miles. I wish I didn't own it. But it's there in the armoury for when all else fails, as a concession to everything I hate. Charlie Alliston, 20, is an ex-courier who hit a pedestrian, Kim Briggs, 44, who died from a head injury sustained in the collision. Briggs left behind a husband and two kids. 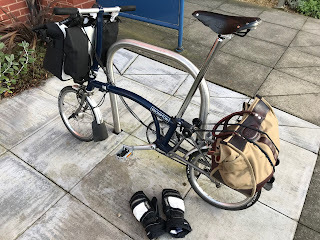 I thought I'd post a few thoughts both as a driver and a cyclist who has spent ten years cycling up and down the great courier corridor of the A10, and all over London on other days. 1. The case has been sensationalised by the media so don't expect a reasonable debate. 2. The widow Mr Briggs is now on a mission to reform the law so that cyclists can be prosecuted, like drivers, for death by dangerous driving (cycling). 3. Alliston's own mother has said the sentencing was appropriate and we know he was a troubled young man who lost his dad as a 16 year old. 5. There is a great public confusion there about so-called track bikes and fixies (more properly, fixed wheel bicycle). 6. I have only seen one single brake-less fixie in the past ten years riding all around the bits of London where they predominate. 7. If you ride a bike in a velodrome you have to remove all brakes. That is for safety. 8. The reason the law says you need a front brake but not a back brake, on a street bicycle, is because two-thirds of the stopping force comes from the front. As others have pointed out, this is why car makers routinely put disc brakes on the front wheels but only drums at the back. 10. ...but a skilled rider can do better with the transmission braking of the fixed wheel than having a caliper rear brake, particularly in greasy or wet conditions. 11. The 'wanton and furious' law is archaic and has caused confusion. Alliston is accused of going too fast but judged to have been riding at 18 mph. Even in the most right-on Boroughs where 'Twenty-is-Plenty', Alliston would not have been speeding. Cyclists are not held to a different speed limit than other road users. 12. So we have a situation where Alliston broke a law that hadn't been enforced, the one about the brake. The law that would conceivably have prevented this tragedy, aside from Alliston's being aggressive or deliberate in his actions (it took the jury 12 hours...) is already there but wasn't enforced. 13. I would welcome bike checks like roadside Police insurance checks. Riders at night with no lights drive me mad (for instance). 14. Funny how all drivers speed and an estimated 100% break the 20mph rule on the nearest road to my home and it's never enforced at all. 15. A great law unenforced is useless. 16. London Mayor Sadiq Kahn has to find £400m in savings from the Met Police budget over the next four years. 17. A driver John Rafferty got 16 weeks in jail for deliberately driving his car into a cyclist and at children. It received tiny mentions in the newspapers. 18. I have only on extremely rare occasions seen road rage among cyclists. 19. There is something inherent to driving in a congested urban environment that results in pent-up frustration, because the car is more powerful than circumstances allow it to travel, and the driver has no outlet for their adrenalin. 20. THREE pedestrians killed in the UK from a collision with a bicycle. 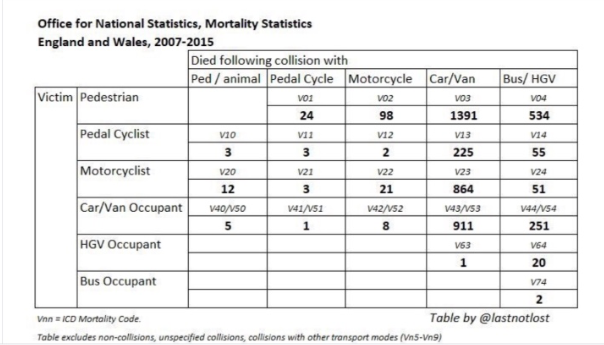 TWO HUNDRED AND EIGHTY TWO cyclists killed by collisions with motorised transport (motorbikes, cars, lorries), over 2007-15. I’ve just met a modern hero, Pedro Faria, Technical Director at the Carbon Disclosure Project based in St Paul’s, London. While my interview with him isn’t directly about cycling, I’ve decided to publish it here anyway, owing to its broad significance to us all, and its indirect significance to matters that have suddenly become urgent to cyclists in most of the world’s mostly polluted cities. We’re all concerned about local emissions and poor air quality, especially Londoners like me who don’t like being washed in silent and invisible waves of poisonous, lung-irritating Nitrogen Dioxide every time we’re behind a diesel-burning jalopy. And there are lots of those in London including 23,000 mostly antiquated black cabs and a vast, poorly regulated fleet of white vans being coaxed along the smoky edge of death by poorly paid internet delivery couriers. But it’s all too easy to forget about the big climate goals that set Europe so disastrously on its road-to-diesel. This is where Pedro and his colleagues come in, including Paul Dickinson, CDP’s Executive Chair and the man who founded CDP in 2000. What a visionary he was for doing that then, at a time that a great number of people didn’t even accept the science around climate change. January, 2007. Lofthouse edited this mag. but the science was clear enough. Not enough has happened since then. We may rue the unintended consequence of dieselization and the backroom lobbying that undoubtedly put the European Union Commission at the service of ‘national champion’ car makers – read French and German - for whom a specific competence happened to be diesel technology around the time that all this happened back in the early noughties. Yet even so diesel was more efficient than petrol then. In fact it retains the edge now, with efficiencies of 10-20% higher than petrol. Euro 6 diesels are cleaner than their predecessors, but what no car maker will discuss is what happens to them ten years down the road when they've missed three services in a row and the emissions kit is knackered or deleted by unscrupulous owners. The fact that diesel isn’t as superior to petrol today is ironically due to the fact that car makers began to import direct injection combustion techniques across from diesel to petrol in the late 1990s, resulting, new research is suggesting, in other forms of ultra-fine particulate matter, from very high pressure petrol combustion. This is why no one in the green lobby wants the current anti-diesel conversation to result merely in a relapse to petrol. They want hybrids as a stopgap, then electric vehicles and fuel cells to take the lead. This may also explain why Faria, somewhat to my surprise, is pretty gung ho about Tesla, whose founder Elon Musk he sees as an archetypal disrupter in a notoriously conservative sector. Within the boundary of the Square Mile that defines London’s financial district, CDP is physically and spiritually at a remove. After all, Pedro and his colleagues want big business to measure and report and reduce their climate emissions, and to agree to science-based-targets to achieve an emissions reduction pathway that prevents the world from self-combusting. Naturally, this is not just about transport, and within that category it’s certainly not just about private cars. It’s about the entire activity of humans on the planet. In fact Pedro was recently widely reported in the press in relation to CDP’s revelation that just 100 companies, globally, are responsible for 71 per cent of carbon dioxide gases released into the atmosphere since 1988. He says that the biggest culprit by far is the Chinese coal industry (14% of global emissions since 1988). Next up is Saudi Aramco (4.5%). Then Russian energy major Gazprom (3.9%). A spokesman for Shell argued that replacing coal with gas was the biggest near-term thing that could be achieved to slash these emissions. That might produce a hollow laugh, except that renewables and the smart grids needed to make them work are not ready. Gas is indeed cleaner than coal, while still being a fossil fuel. Faria says that the goal of CDP is to achieve ‘transparency’ rather than a blame game. The net result of all this is that mining and energy are the big climate emitters, not car makers, and not even the aviation industry. Transport consumes fossil fuels already retrieved and refined and transported. In respect of emissions responsibility, this places car makers in a particularly grey zone because they might accept responsibility for the emissions associated with manufacturing a car, but the emissions associated with its life time consumption of fossil fuels typically sits with the private owner. Is the car maker also responsible for the emissions of producing the oil, without which the car would be rendered useless? This is where a fantastically complex argument breaks out around Scope I, II and III emissions. To cut a long story short, Faria notes that the French car makers have been more ready than others to sign up to CDP targets, because they can sketch an elegant pathway to electric vehicles refueled by low-carbon French nuclear energy; beyond that the middle-century goal of an economy of services and shared mobility assets (car pooling and car clubs instead of private ownership), and intelligent end-of-life recycling and re-use – car batteries put to domestic use and so forth. An explosion in electric-assisted cargobikes will completely change last mile delivery in city centres, reducing point-of-use emissions and climate emissions. To those who say electrification doesn't suit heavy goods vehicles, look beyond it to the hydrogen fuel cell, which is a form of electrification that does work for heavy vehicles. Pedro oversees the development of CDP’s disclosure platform, scoring systems and data, and previously worked on the implementation of the European Emissions Trading Scheme. We end our chat with me bringing up the fact that cycling has been considered the most efficient transport of all, with some estimates putting the energy-to-distance travelled equivalent at 3,000 miles to the gallon. That’s a measure of the efficiency of the bicycle; and of the human body in converting a cheese sandwich into biomechanical energy. I know I see the world through a narrow funnel but at the end of every conversation there’s the stubborn reality that cycling is still there in front of our noses and could be promoted at low marginal cost as a real solution to so many of these mind-bending global climate problems we face. It’s a source of consolation in the face of what’s actually unfolding. It's fifty years today since Tommy Simpson died on the Ventoux on the 13th stage of the 1967 Tour, so I thought I'd just put up this simple post to honour him. In William Fotheringham's excellent book Put me back on my bike, which was published in 2002, he makes a stray comment to the effect that Simpson paved the way for other non-Continental riders to succeed at a quintessentially continental, mainland European activity: professional road racing. Fotheringham then mentions Lance Armstrong at a time when we didn't know for sure that he'd doped. At a later remove I'm sure Fotheringham would have also mentioned Wiggins. The irony of course is the doping, perhaps adding a coda in the form of therapeutic use exemptions and jiffy bags. Simpson was spending the equivalent of four year's wages on a single season's amphetamines, going after what was considered at the time to be the Rolls-Royce of amphetamines, Tonedron. On the day he died he had three ampoules in his jersey pocket, two and a half taken. He'd drunk cognac to dull the pain of an upset gut, and probably Coca Cola earlier on a big stage in high Provencal heat. All these substances de-hydrated him, on the back of having had diarrhoea for three days. In the massive heat as he came up the final sections of the mighty Ventoux, when above the tree line it becomes blinding white stone and a sun-baked oven of scree, his body signalled enough and he began to weave. Helped back on he continued for five hundred metres before collapsing forever from exertional heatstroke, greatly exacerbated by dehydration and by the drugs and alcohol. His fingers had to be prised off the handlebars and he was completely dry to touch. His team member was convinced that he had died on the bike. In any sense except the clinical, I think that's probably true. His death takes its place in a long row of completely avoidable British deaths in the 'amateur' pursuit of something crazy. Donald Campbell had died earlier in the same year in January 1967, pursuing a speed record on Lake Coniston. And yet there is so much to admire. Simpson was as obsessed about his diet and his training and in fact every single aspect of his life, in pursuit of victory. Doping was merely his reluctant (but inevitable, and wouldn't we have done it in his shoes?) acceptance of what was rife among virtually all European riders at the time, as indeed it has been since for so many others. He was careless about his own well being when it came to winning but he was a brilliant rider and a brilliant winner. He also paid the ultimate price for winning at any cost, which leaves a question mark that we all have to answer for ourselves. *Thanks to BMW UK and Rapha Travel for making this trip happen. 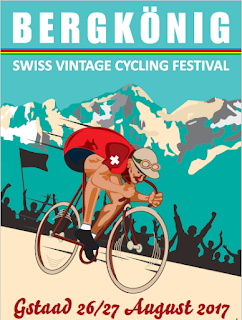 Switzerland is joining the vintage cycling fray with The Bergkönig, a vintage cycling festival to be held for the first time in the village of Gstaad on the weekend of 26-27 August, 2017. Read on for detailed notes about the course, which we are the first to ride on an old steelie, and a preview of the event and how to get there. Websites and contacts at the end. Think L'Eroica ('The Heroes')– Italy’s runaway success, where only pre-1987 steel racing bikes are allowed. First held in 1997, L'Eroica has spawned a whole movement. The Eroica brand has been leased by its owners to events in Spain, the US and the UK, while standalone rides such as the Retro Ronde in Belgium and La Superba in Italy have become popular. The largest event is estimated to be Eroica Britannia, held in mid-June in the UK's Peak District. 40,000 visitors attended it in 2016. Bergkönig founder and Swiss vintage bike collector Alex Beeler and his wife Francesca (+41 79 217 62 04) are now launching the Swiss Vintage Cycling Festival. It will offer a vintage bike market and events and rides in the village of Gstaad, over the weekend of August 26-27, 2017. The whole focus of the Bergkönig will be on friendly, non-competitive, family fun. Numerous rides are offered, several of them just 20kms in length, to encourage the widest possible participation on even the most fragile machines. 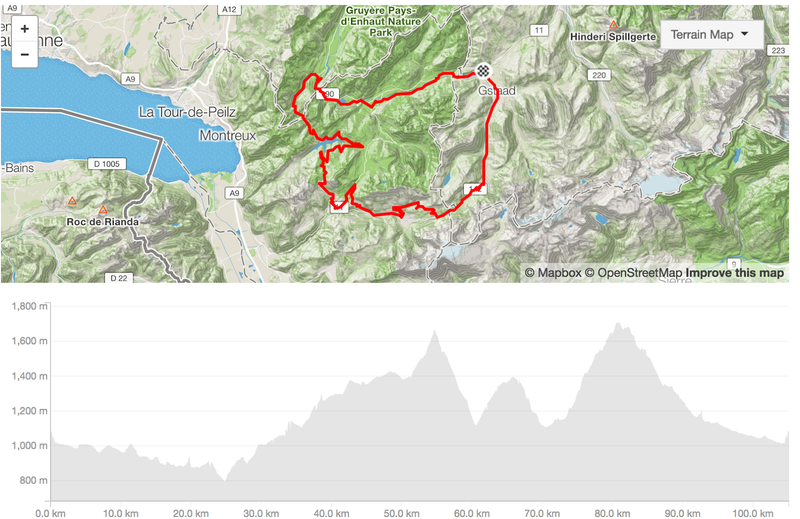 These rides, up to 85kms in length, are collected under the title Pedaleur du charme, the nickname of Swiss race legend Hugo Koblet (1925-64). 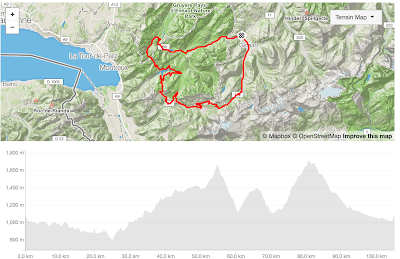 However, make no mistake, the defining ride is the namesake Bergkönig-Ronde which translates 'King of the Mountains Loop', and which takes place on the Sunday. You set off from Gstaad the village (it’s also a region in the Canton of Bern). Ahead is a fantastically pretty schlepp down a valley on country lanes, with one particular back road that you turn left in to by the church in Rougemont. It's got the odd kick-up but as the profile shows, overall you're losing altitude. Now is the time to shake out your legs and get the feel for whatever bike you've got. In my case I was on a bike I'd only ridden that morning, and I was gingerly plying the six speed cassette; remembering that riding on the hoods is for sissies (they are not comfortable because hands were not meant to perched on them); wondering if the slightly short (for me) top tube/stem combo was going to be a deal-breaker or merely a minor detail (the latter, thankfully), and wondering with trepidation at the hard-man gearing, the lowest ratio 42x26. I was also busy figuring out where I was going, with only a map and some verbal instructions, but I can say that this is essentially a bulletproof ride. It takes advantage of a mosaic of already well sign-posted bike routes. The handful of critical turn-offs will be amply signposted on the day and I'd be most surprised if anyone goes off route through error. The circular nature of the route is also welcome, making logistics easy. The first 25kms of the ride, all the way down to the turn at Montbovon, is easy streets. It's also Swiss beauty to die for and unless it happens to be pouring with rain you'll see bell-ringing cows, tiny high-altitude wild flower meadows and woods, and a mosaic of farmhouses, machinery and dogs and cats and birds in abundance. If it doesn't break into your inner-Swiss, something will have gone wrong. At Montbovon there is a crucial turn that you won't miss, and here is where the ride proper begins. Immediately you're climbing, and while there are respites, you are now gaining altitude for the next 18 kms to Lac de l'Hongrin, a huge reservoir high up in the alps. This is a lovely climb through woods. There are respites, but as you exit the trees it kicks up and suddenly you're aware of the residual rolling resistance of a back tyre deliberately left at 85psi instead of 100 +, to reflect the often fidgety surfaces of these roads. You're fully at work and if it's hot, you'll be aware of that too. On reaching the dam you're off down the side of the lake now, all very lovely. Towards Mont Blanc, from the summit of Pierre du Moëlle, 1,650m. ...And so a sign appears pointing left to Pierre du Moëlle. This is the bit on the profile around the 50kms mark, where steady climbing points skywards and suddenly gets much steeper. This is where you're at 100% effort for the first time, and indeed I quickly found myself having to weave across the road from side to side to keep moving in a 42x26 ratio. The sharply cut drainage channels now become a hazard, because if you were to accidentally converge with one it would swallow your wheel and quite possibly end your ride there and then. Now's the time to grit - but stop and pause or walk if you need to. Lots of riders will need to. The view at the top is incredible, and is followed by a pretty technical descent where a healthy dose of caution is advised, not least because the road is so narrow. At the base of the descent you arrive at a main road where you'll be grateful to turn left and have a more normal gradient and a billiard ball smooth surface - but you've got another climb of over a kilometre before turning right towards Les Voëttes. More climbing here, this being the third of the climbs and on the profile the smaller 'hump' in the middle. Another descent and then some smooth road again to the ski station of Les Diableret. Here in Les Diableret there is another critical left turn and, I anticipate, a feed station, because the biggest climb lies immediately ahead, 7 kms of unrelentingly steep ascent. The day I did this it was 27 degrees centigrade - not as hot as it can be - and I was tiring. The heat beat relentlessly off the rocks and all I can say is that 4/5th of the way up you pass a couple of houses on a hairpin bend, and there in front of you is a mountain trough full of sparkly clean icy cold water. I stopped and immersed my whole head in it, tipped water down my neck and refilled my bidon. Take stock: you have about 1km to go so it's going to be OK.
Road to Iserau. This is the 4th climb of the event, also the hardest. You won't see this view because you're eyes will be full of sweat. Swiss fizz made from milk whey. Delish. Actually its not. You've got 35kms left to savour. The initial descent is as technical as ever and be careful not to overdo it across the cattle grids as I did, hitting one so hard I slightly threw the rear wheel out of true. When you reach the junction with the main road you turn left and the sign posts are once more for Gstaad. Now you've got billiard ball surfaces again and a fast, beautiful ride that flatters everyone because it's downhill even though it may not look it. Presently you reach the start/finish and hopefully a hero's welcome. Timingwise I took 5 hours 45 min, but including stops and quite a lot of iPhone mapping checks, I was actually on the road for nearly 8 hours - a 9 to 5 'long day in the saddle'. In order to enjoy the stops, the views and the atmosphere you may find yourself doing likewise. View it as a lovely long day out and savour every moment. By way of a summary note, I think this was one of the finest rides I've experienced in recent years. It's not only ravishingly beautiful, to the point where if you're from the UK you'll bitterly regret it, but it's got grit and a sort of material distinction and charisma that is rare. Not seeing a single piece of litter from start to finish is also a first. Regarding the vintage bit, I found myself increasingly appreciating a heavier but somehow purer, GIOS-built Colombus SL-framed mid-eighties race bike, in this case equipped with Dura-Ace 7400. It belongs to Alex Beeler, the organiser, and was the first generation bike to feature Look-style cleated pedals (which scrape in as allowable, according to the rules), although I rode it with Quoc Pham shoes (the Fixed model) and clips and straps. 1. the ideal tyre is 700x25, and for me the perfect contender is the Continental GP Four Seasons because of it's supple ride but strong cut protection. 2. Get the gears...Old school gearing is going to hurt you on this course, but if you can ride most of it and walk a little, you'll feel you've had a unique experience compared to a modern bike. I was surprised how much I loved the older bike and a return to the downshifters I started on as a teenager. www.bergkoenig-gstaad.com. 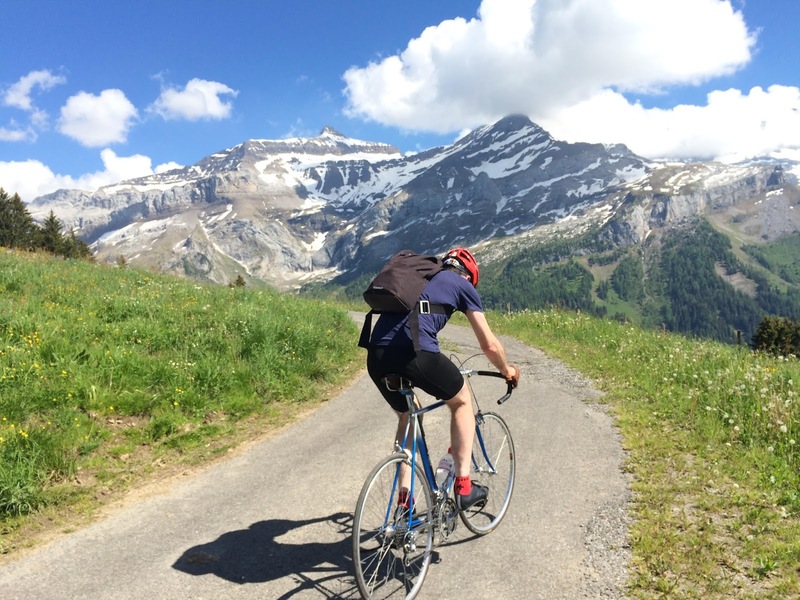 The cost of riding is Chf 100, about £75 at current exchange rates. The easiest way to get there from the UK is to fly to Geneva and then take a train to Montreux, changing onto the panorama 'Goldenweg' train that then climbs brilliantly towards the sun-lit Bernese Oberland. Alex's direct contact is alex@marketing-goetti.ch / +41 79 217 62 04 and he can advise on bikes and bike rental if you don't have one. We stayed at the Hotel HUUS above Saanen, the adjacent village of Gstaad. This is a cool, recently-opened, sporty chalet-style property boasting a wide range of summer events and activities all included in the price - very well worth considering if you would otherwise pay for those activities (everything from yoga to rafting - budget £200 per night). This four star property also has a very relaxed electro-beat DJ vibe and its own fleet of mountainbikes which you can simply take if you just want to whizz down the hill to the village. Of course there are camping and B&B options too and the event website links to the excellent tourist office, who will sort you out. There are good bike shops in each village: I recommend Arthur Reuteler of Bikesport Reuteler, +41 33 7445133, www.bikesport-reuteler.ch. (2) On the other hand you might so fall in love with this place that you ditch Milton Keynes and stay forever, in which case you'll be the one earning Swiss francs. (4) This is the inaugural event. When it's one day catering to thousands of visitors, you'll look back longingly on the intimacy of the first edition. (5) We're in a vintage moment for good reason. If you have attended the Goodwood Revival you know all about it. But the purest transport form of all is not an old Ferrari but a steel-framed racing bike. Anyone who disagrees hasn't tried it. OK, we're not anti-old Ferrari, but the point stands. It's also possible for anyone to buy the bike but not the Ferrari. A bigger point. THANKS: To Alex and Francesca Beeler for making this happen, and for their God-sent apricots and buttered bretzel (you have no idea how good this was or how much I needed it! ); Sara Roloff and Harry White at the Swiss Tourist Board in London, UK, the staff and general manager of HUUS, Arthur Reuteler of Bike Sport in Saanen. Copyright Richard Lofthouse 2012. All rights reserved.